IIHS Top Safety Pick. 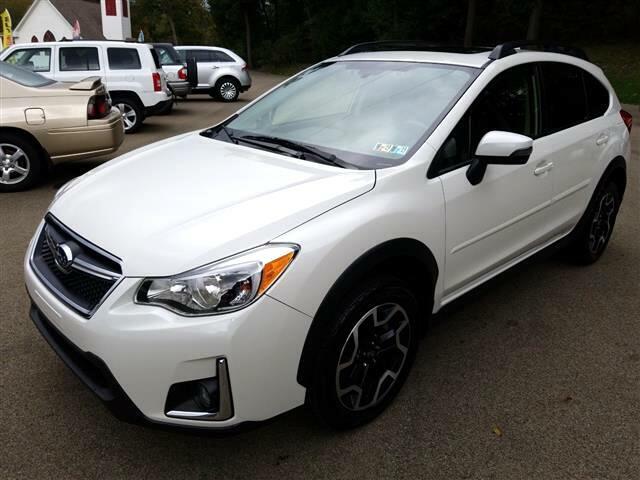 This Subaru Crosstrek boasts a Regular Unleaded H-4 engine powering this Variable transmission. *Options:*All Wheel Drive, Power Steering, ABS, 4-Wheel Disc Brakes, Brake Assist, Aluminum Wheels, Tires - Front Performance, Tires - Rear Performance, Temporary Spare Tire, Heated Mirrors, Power Mirror(s), Integrated Turn Signal Mirrors, Rear Defrost, Privacy Glass, Intermittent Wipers, Variable Speed Intermittent Wipers, Rear Spoiler, Power Door Locks, Fog Lamps, Daytime Running Lights, Automatic Headlights, AM/FM Stereo, CD Player, Satellite Radio, MP3 Player, Bluetooth Connection, Telematics, Auxiliary Audio Input, HD Radio, Smart Device Integration, Steering Wheel Audio Controls, Bucket Seats, Heated Front Seat(s), Pass-Through Rear Seat, Rear Bench Seat, Adjustable Steering Wheel, Trip Computer, Power Windows, Leather Steering Wheel, Remote Trunk Release, Keyless Entry, Cruise Control, Climate Control, A/C, Leather Seats, Driver Vanity Mirror, Passenger Vanity Mirror, Floor Mats, Cargo Shade, Security System, Engine Immobilizer, Traction Control, Stability Control, Front Side Air Bag, Blind Spot Monitor, Cross-Traffic Alert, Tire Pressure Monitor, Driver Air Bag, Passenger Air Bag, Front Head Air Bag, Rear Head Air Bag, Passenger Air Bag Sensor, Knee Air Bag, Child Safety Locks, Back-Up Camera*Feel Confident About Your Choice *Wilson Auto Sales, LLC graded the Overall Condition of this vehicle as Excellent. Clean, non-smoker interior! *Stop By Today *Test drive this must-see, must-drive, must-own beauty today at Wilson Auto Sales, LLC, 5369 National Pike, Confluence, PA 15424.